Microscopy and Microanalysis publishes original research papers in the fields of microscopy, imaging, and compositional analysis. This distinguished international forum is intended for microscopists in both biology and materials science. 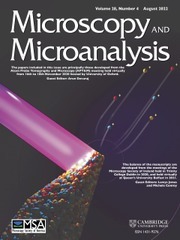 The journal provides significant articles that describe new and existing techniques and instrumentation, as well as the applications of these to the imaging and analysis of microstructure. Microscopy and Microanalysis also includes review articles, letters to the editor, and book reviews.